Why theater? : For the collaborative experience of rehearsal, and the communal experience of performance. For the thrill of the live high wire act. Because I'm better at writing dialogue than description. Tell us about HOAXOCAUST! : It's a satirical solo show about a man who travels the world meeting Holocaust deniers, while struggling with how much to let past horrors define his identity. Some of the deniers' "arguments" are so ridiculous as to be funny; others are so cloaked in pseudo-science as to be terrifying. It all adds up to a pretty dark comedy. What inspired you to write HOAXOCAUST!? 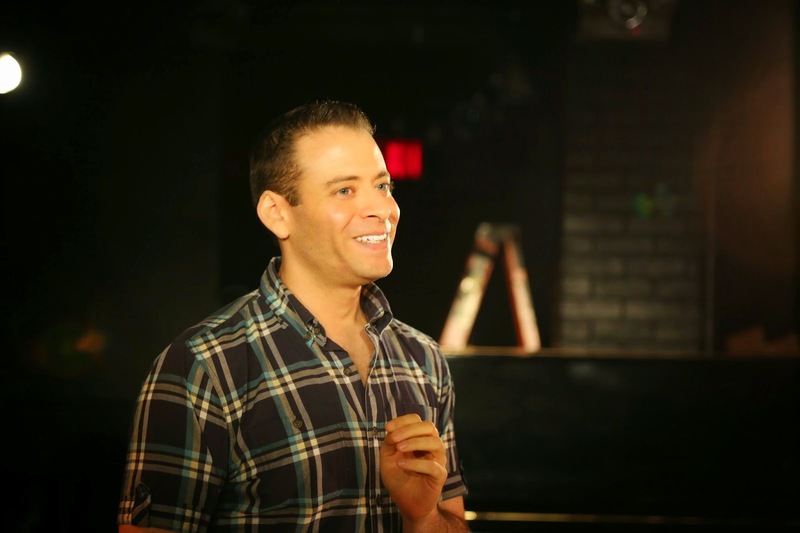 : Our director Jeremy Gold Kronenberg had a weekend slot in Prospect Theater Company's "Dark Nights" series five years ago, and asked if I would write something. I pitched him an epic, Dan-Brown-meets-Indiana-Jones adventure with a cast of dozens. He said "Great: now make it a one-man show." Hoaxocaust was born! I'd never done a one-man show before and I love setting myself new formal challenges with each play, so the restrictions became inspiring. What kind of theater speaks to you? What or who inspires you as an artist? : I like art that's in dialogue with history, as well as an audience. Not that it has to be historical, but it should have an awareness of the continuum it's in, the fellow travelers on its path. I geek out when a work inspires me to seek out other works by other artists that are part of the same conversation. Also I like things that are funny. Also I'm a sentimentalist. If you could work with anyone you’ve yet to work with, who would it be? : Scott Rudin. What show have you recommended to your friends? : Just last night, I was telling some friends who missed it how good Fault Line's production was of Crystal Finn's The Faire last spring. Who would play you in a movie about yourself and what would it be called? : Now that I've mastered performing for Hoaxocaust!, I'd play myself! Unless I need someone who can "open" a film, box-office-wise. Then, obviously, Rick Moranis. What’s your biggest guilty pleasure? : I eat a family-sized tub of hummus a day. While watching Bravo and HGTV. What’s the most played song on your iTunes? : The past few months I keep coming back to the Belle Brigade. But my computer tells me the true answer is "Diane Young" (Vampire Weekend). If you weren’t working in theater, you would be _____? : Animating stuff, if I could draw. Also at one point I seemed to have a promising career as a children's birthday party magician. What’s up next? : I'm keeping my schedule clear, in case my acting is so celebrated after Hoaxocaust! that I get asked to anchor a superhero franchise. If not: another play.